Caution: The new Manto X Pro Light gi may turn you into a Spartan War god from 480BC. It may also turn you into Abraham Marte. The Manto X Pro Light gi is offered in two color variations: Blue with white stitching and white with purple stitching. Originally, I was skeptical about checking out on of Manto’s gi because I’ve always enjoyed their nogi gear, but some of their original gi offerings weren’t that great. Would this be different? The Manto X Pro Light gi features a 450gsm pearl weave jacket and ripstop pants. The gi seems to be a middle-of-the-road training and competition gi. It’s not superlightweight (causing a loss in durability) or heavyweight (making it difficult to wear to weigh in at IBJJF tournaments). The ripstop trousers help to round out a gi that will be a solid training gi today, next year, and on into the future. Initially (and as seen the video above), you can see that this gi was a bit large on me (photos are pre-wash). According to their size chart, the Manto X gi in size A3 will fit somebody who is 5’11” – 6’4″ so as I am about 6’1″, it’s understandable that this gi is a bit long on me. Additionally, the weight requirements for the Manto X gi are 175-210lbs. I’m at the top end of the weight limit for the gi and I feel that it could easily accommodate somebody who is 225lbs. Best to stick with the size chart found below. Measure a gi that you love the fit of and compare its measurements to the ones below to ensure the best fit! The new Manto X Pro Light gi strikes me as a typical ‘Manto‘ design: classic with a bit of crazy. I still think the above image is only loosely tied to that, but it doesn’t change the fact that the man plugging his ears still makes me chuckle. The large ‘X’ design on the interior of the gi is clean and bold, much like the rest of the design. It can’t be seen while wearing it, or even if your jacket opens up, like on DoOrDie gis, but it does create an aura of ‘BJJ Lifestyle’ that serves as a great reminder to the wearer whenever they put it on. I think I might be a bit crazy, but I really like it when a gi has a great overall design, without having to repeat the same 2-3 patches or embroidery all over it. This solo patch on the shin is very small and understated and can’t be found anywhere else on the gi. I love that. The Scramble Athlete gi is also similar in this manner because it has a great cohesive design, but without repeating the exact same design over and over. 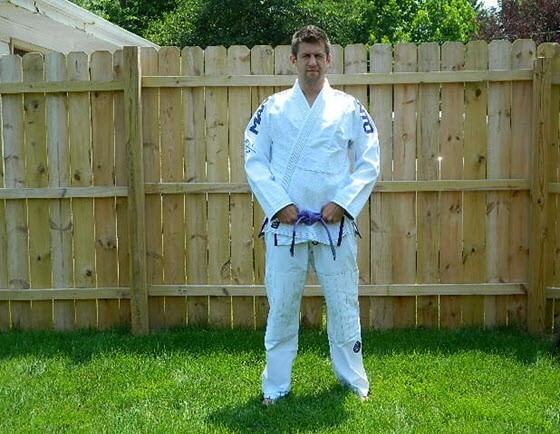 There is a cool cohesiveness that permeates the design of this gi. Everything flows together nicely with nothing out of place. The theme is held through the embroidery, all patches, cuff tape, and even the washing label. The jacket is made of 450gsm pearl weave material and if it weren’t so big on me at first, it probably wouldn’t have felt that heavy. I wore it once to class without washing it, which was absolutely dreadful. After that, I washed and dried it numerous times to get it to shrink down to a level that would fit me. One of my first qualms with gis is whether they are able to be worn comfortably. When I noticed that the Manto gi had a lot of taping all over the inside of the jacket and sleeves, this was immediately a concern. Thankfully, the taping on the jacket is comfortably folded under and properly done. Because it should be. Additionally, the jacket features very minimal reinforcements (maybe to keep it lighter), and seems to me to be a very average pearl weave jacket. There is really nothing too special about the trousers. They’re a solid, basic ripstop pant without an extra frills or foolishness. The drawstring system is a standard 4 loop system that does its job without having to do anything revolutionary. This also means that you’ll have no trouble getting them approved for IBJJF gi checkers. And if you do, just go stand next to Abraham Marte wearing his. You’ll get a pass. I had no trouble pulling off my inverted half-galaxy Portuguese omelet (patent-pending). What kind of move is that, you ask? Can you post a video? No, I can’t. It’s that serious. It’s basically a berimbolo, into a crucifix, into an inverted standing triangle, 4 backflips, and a cross-collar choke. Basically. As I mentioned previously, rolling with a gi that is ill-fitting is awful. The A3 in Manto is cut larger than my Tatami Estilo and CTRL Industries A3 gis so wearing it without shrinking it first was a mistake. Once I shrunk it down, it fit great and was a pleasure to roll and train in. Sometimes when gis are shrunk, they tend to stretch during training and I didn’t notice any significant stretch of the sleeves or pants while I trained. Although the belt loop system is minimalist, I didn’t notice any extra riding up of the belt or falling down of the pants. The Manto X Pro Light gi can be found for around $175 from online retailers (check Amazon for current prices) so I think this is a fair offering for its great quality at that price point! You can see, this gi also comes in an awesome blue/white combo (modeled again by the AWESOME Abraham Marte who is, coincidentally, rocking a patch from our good buddies at Gawakoto). ARTICLE ORIGINALLY PUBLISHED OCT 15, 2013. How much did you get the gi to shrink? Thanks for the commend Jacob! It shrunk down pretty nominally. Nothing too drastic so in the end, it fit quite well. Thanks for the amazing review! I got me a Manto Diamond and it has a similar cut, I want to shrink it but I dont have a drier, it shrunk a little but still the sleeves are a little larger than I would like, do you happen to know a method that would help? Thanks! Wet down just the sleeves in really hot water and then throw it back in the dryer on hot. That’ll hopefully shrink the sleeves down more! Lol brendan he said he has no dryer!